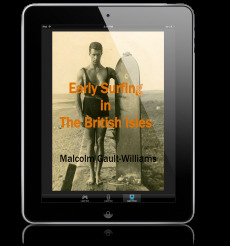 In-Depth Writings on Surfing's History and Culture by Malcolm Gault-Williams, surf writer and historian for over 25 years. I've wanted to write this chapter and add it to the LEGENDARY SURFERS collection for a very long time. Over the decades since his death, there's been a good deal of folklore added to Nick's history as a surfer. Wanting to get the story straight, myself, I've done my own research and this is the result. I hope Nick's story inspires you as it has many others. Nick Gabaldon, U.S. Naval Reserve, 1945-46. Original image source unknown. 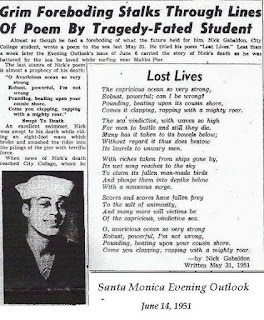 Nicolás Rolando Gabaldón (February 23, 1927 – June 6, 1951) was California's first documented surfer of African-American and Latino descent -- at a time when many beaches were segregated and opportunities for minorities more limited. By this time, the focal point of Southern California surfing had shifted from San Onofre to Malibu Beach. For a long time, actually, both served as a bi-polar axis for California surfers. The innovations were being made at Malibu, though, and the waves coming off cobble stoned Malibu Point were and continue to be some of the finest -- some would say thee finest -- waves along the West Coast of the United States. Without question, the surfers there would go on to become legends in the sport -- as did Nick. Nick with tandem partner Agnes Quigg, Malibu. Photo by Joe Quigg as part of the Vicki Williams Collection. Robust, powerful, can I be wrong? Comes it clapping, rapping with a mighty roar. For me to battle and still they die. Its laurels to unwary men. Robust, powerful, I’m not wrong. Pounding, beating upon your cousin shore. 1 Yelland, Richard. Email to Malcolm, 8 August 2018; founder, director of Curtis Birch, www.curtisbirch.com. 1 Nick Galdon, Wikipedia, viewed July 2018. 2 Nick Galdon, Wikipedia, viewed July 2018. 3 Blocker, Rick. 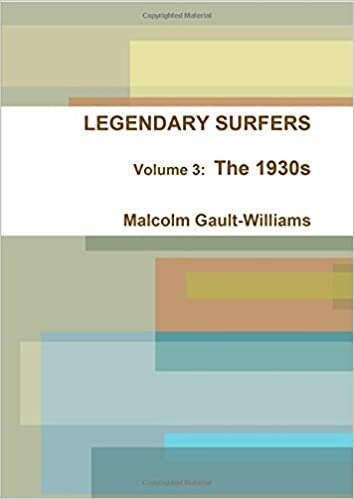 “Nicholas R. Gabaldon, California’s First Black Surfing Legend,” originally posted at LEGENDARYSURFERS, February 2005. 4 Blocker, Rick. 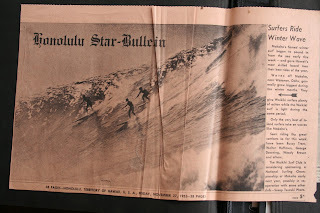 “Nicholas R. Gabaldon, California’s First Black Surfing Legend,” originally posted at LEGENDARYSURFERS, February 2005. 5 Harper, Rhonda R. “Xtreme Factor: Urban Legends Become Real Life Heroes,” blackathlete.net, May18, 2007. 6 Blocker, Rick. “Nicholas R. Gabaldon, California’s First Black Surfing Legend,” originally posted at LEGENDARYSURFERS, February 2005. 7 Blocker, Rick. 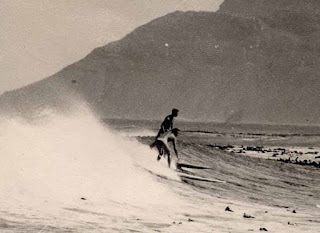 “Nicholas R. Gabaldon, California’s First Black Surfing Legend,” originally posted at LEGENDARYSURFERS, February 2005. 8 Nick Galdon, Wikipedia, viewed July 2018. 9 Harper, Rhonda R. “Xtreme Factor: Urban Legends Become Real Life Heroes,” blackathlete.net, May18, 2007. 10 Nick Galdon, Wikipedia, viewed July 2018. 12 Blocker, Rick. “Nicholas R. Gabaldon, California’s First Black Surfing Legend,” originally posted at LEGENDARYSURFERS, February 2005. Matt Kivlin quoted. 13 Nick Galdon, Wikipedia, viewed July 2018. 14 Blocker, Rick. 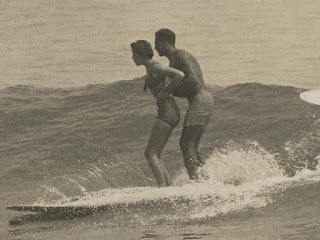 “Nicholas R. Gabaldon, California’s First Black Surfing Legend,” originally posted at LEGENDARYSURFERS, February 2005. Bill Shea quoted. 15 Nick Galdon, Wikipedia, viewed July 2018. 16 Harper, Rhonda R. “Xtreme Factor: Urban Legends Become Real Life Heroes,” blackathlete.net, May18, 2007. Les Williams quoted. 17 Warshaw, Matt. Encyclopedia of Surfing. Ricky Grigg quoted. 18 Williams, Les. Email to Malcolm, March 2005. 19 Harper, Rhonda R. “Xtreme Factor: Urban Legends Become Real Life Heroes,” blackathlete.net, May18, 2007. Mickey Munoz quoted. 20 Blocker, Rick. “Nicholas R. Gabaldon, California’s First Black Surfing Legend,” originally posted at LEGENDARYSURFERS, February 2005. 21 Harper, Rhonda R. “Xtreme Factor: Urban Legends Become Real Life Heroes,” blackathlete.net, May18, 2007. 22 Harper, Rhonda R. “Xtreme Factor: Urban Legends Become Real Life Heroes,” blackathlete.net, May18, 2007. 23 Nick Galdon, Wikipedia, viewed July 2018. 24 Blocker, Rick. “Nicholas R. Gabaldon, California’s First Black Surfing Legend,” originally posted at LEGENDARYSURFERS, February 2005. Ricky Grigg quoted. 25 Nick Galdon, Wikipedia, viewed July 2018. 26 Gabaldon, Nicolas Rolando. 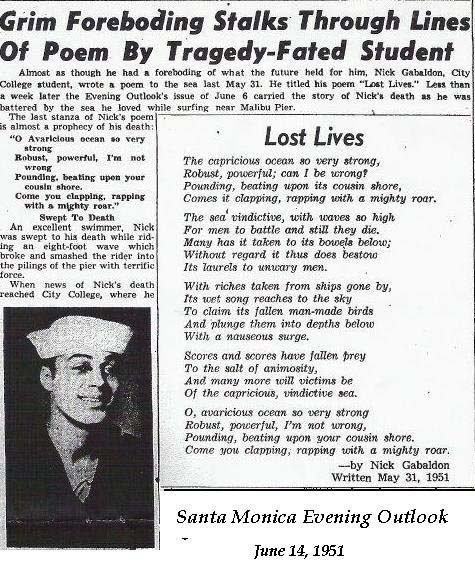 “Lost Lives,”written on May 31, 1951 and published in the Santa Monica Evening Outlook, date unknown. 27 Nick Galdon, Wikipedia, viewed July 2018. 28 Nick Galdon, Wikipedia, viewed July 2018.